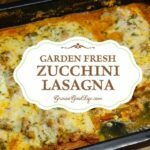 This delicious garden fresh zucchini lasagna is made with thin slices of zucchini instead of pasta noodles. It is a gluten-free alternative with all the flavor of the traditional version. Also freezer friendly for make ahead meals. I am elated when I am able to make a meal that incorporates so many home-grown ingredients. The zucchini is from the garden along with the onions, garlic, and parsley. The eggs are from our flock of hens. Even the sausage and cheeses came from a farm store nearby. A leafy green garden salad with Italian salad dressing and homemade bread rounded out this meal. I missed harvesting fresh zucchini from the garden last year. Our neighborhood deer saw to it that I was only to have a few zucchini before they nibbled the plants down to nothing. This year, the plants are under protection of hoops and deer netting. I also doubled the amount of plants I normally grow just in case. I have big plans for preserving zucchini this year. 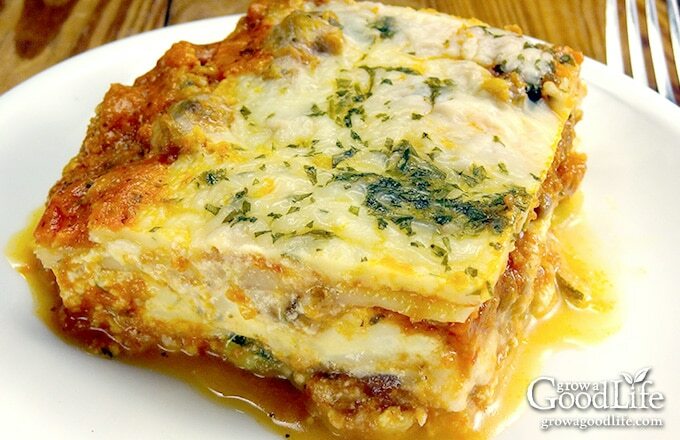 One of my favorite ways to use zucchini is to make zucchini lasagna with homemade tomato sauce. Often times, I make a double batch and freeze the extras. 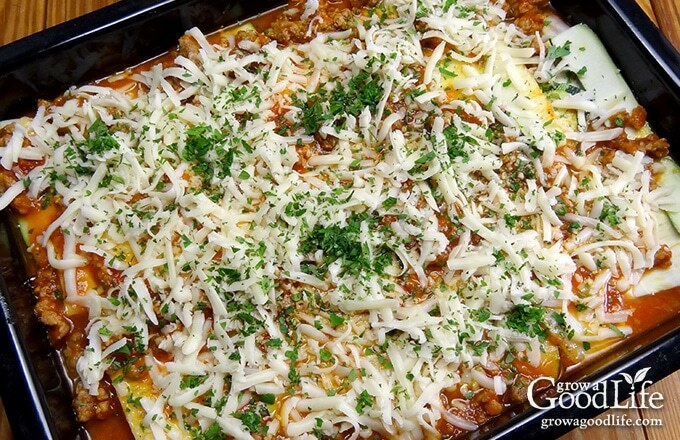 It is worth the effort to assemble several lasagna casseroles at one time and store the extra in the freezer for a future easy dinner. Check out how easy it is to make your own tomato sauce from fresh tomatoes. Get the recipe for Fresh Summer Tomato Sauce. Slice your zucchini thin. 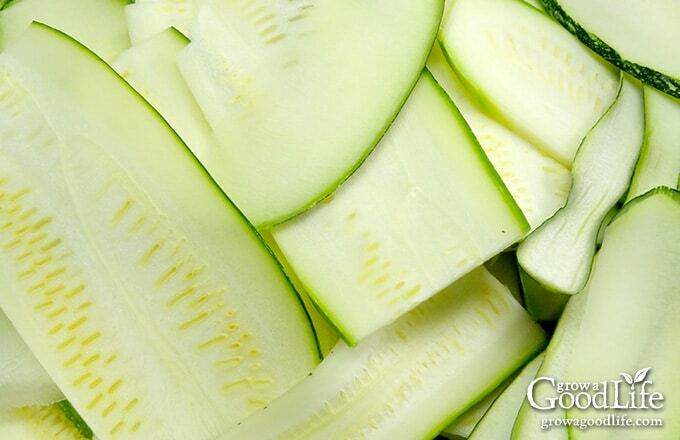 Rinse and slice the zucchini into 1/8-inch strips (about 3 mm) using a knife, mandolin, or vegetable peeler. Pat the zucchini dry with a clean towel and set aside. If you are using a knife to slice the zucchini. Cut off a portion to stabilize the zucchini and stop it from rolling. Then slice it carefully into thin strips. Prepare your meat sauce: In a large skillet, over medium heat, add the olive oil and sauté the onion until it is tender. Add the garlic and sausage and cook it until the sausage is no longer pink. Add the tomato sauce and salt and pepper to taste. Reduce the heat to low and simmer sauce for 15 minutes or longer. 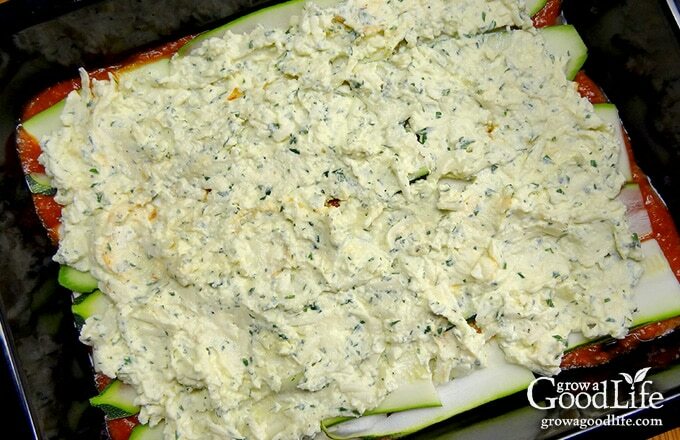 Blend your cheeses: Combine ricotta, Parmesan, half of the mozzarella, eggs, and parsley. Start layering your lasagna: Ladle your meat sauce and spread to cover bottom of your lasagna pan. Layer the sliced zucchini over the sauce overlapping the edges slightly. Layer the cheese mixture, and follow with a layer meat sauce. Repeat layering until the pan is full. Top with remaining mozzarella cheese and sprinkle with the reserved parsley. Bake until done and let the zucchini lasagna rest for a while before slicing. Serve and enjoy. Thinly sliced zucchini is layered with homemade tomato sauce, sausage, and three cheeses in this version of a much-loved comfort food. 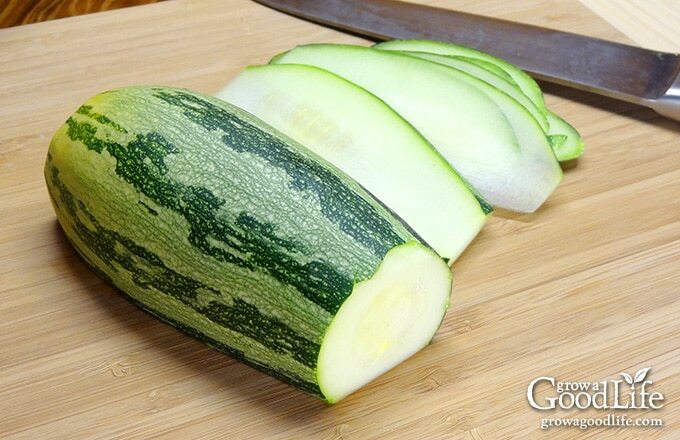 Rinse and slice the zucchini into 1/8-inch strips (about 3 mm) using a knife, mandolin, or vegetable peeler. Pat the zucchini dry with a clean towel and set aside. In a large skillet, over medium heat, add the olive oil and sauté the onion until it is tender. Add the garlic and sausage and cook it until the sausage is no longer pink. Add the tomato sauce and salt and pepper to taste. Reduce the heat to low and simmer sauce for 15 minutes or longer. In a medium bowl combine ricotta, Parmesan, half of the mozzarella, and eggs. Reserve about 2 tablespoons of parsley to sprinkle on top of the lasagna, and add the rest to the bowl. Mix well and set aside. Ladle sauce to cover the bottom of a 9 x 13 pan. Layer the sliced zucchini over the sauce overlapping the edges slightly. Layer the cheese mixture, and follow with a layer meat sauce. Repeat layering until the pan is full. Top with remaining mozzarella cheese and sprinkle with the reserved parsley. Cover the pan tightly with foil and bake for 45 minutes. Then uncover and bake for an additional 15 minutes or until bubbly. Remove the zucchini lasagna from the oven and let it stand for 15 minutes to set before cutting. Serve and enjoy. Prepare and cook the zucchini lasagna as described above. Once the lasagna has cooled, cut and place into freezer containers or freezer zipper bags. Freeze for up to 3 months. 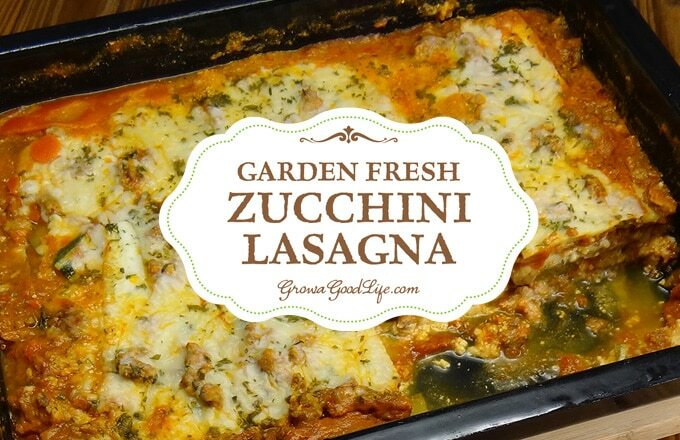 Thaw the frozen zucchini lasagna overnight in the refrigerator before warming. Remove from the freezer container and place it in a baking dish and cover with foil. Bake in a 350°F preheated oven for 30-40 minutes, or until heated through. Let it stand for 15 minutes to set before cutting. Hello! I am trying to find healthy receipes like this thst I can take to work and heat in the mircowave. Would this cause the zucchini to be watery or gross? Kris, Yes, you can reheat in the microwave. The zucchini is a bit watery as you can see in the photos, but it will not change the taste. I don’t care for the watery result of using raw zucchini in my lasagna. So I cut my slices thick – 1/4″ and then roast them. THen I build my lasagna. Tara, That is a great tip. The zucchini do release a lot of moisture as they cook. It’s probably hard to believe, but my four zucchini plants are not producing large fruits. I got two fairly large ones early in the season, but since then they’ve all been small. Looks delicious – and I actually have some extra zucchini that I could use.